In September 2006 Bellevue Gallery featured an exhibition entitled ”Scarcity and Abundance” documenting life in Uganda, Rwanda and the DR Congo as experienced by eight West Vancouver residents. Proceeds from this exhibition went directly to Canadian Food for the Hungry International to support their work in these areas. 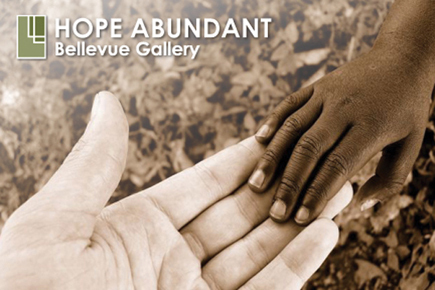 In September 2007 Bellevue Gallery was honored to host their second humanitarian exhibition, entitled ”Hope Abundant.” In an effort to demonstrate how your support of ”Scarcity and Abundance” helped those less fortunate, the ”Hope Abundant” exhibition focused on one small village in southeastern Uganda. Encouraged by CFHI and a group of committed individuals from Capilano Christian Community, all with a desire to make a difference, the village of Bufukhula meets the daily challenges of poverty and illness with an abundance of hope. Powerful images combined with story made this exhibition a touching experience. Team member Angela Heino, a field nurse who recently resided in Uganda for a five month period, shared her experience on opening night and again on the following Sunday afternoon. Angela demonstrated how simple nutrition and health care intervention transformed a failing infant named Peace. Peace is now thriving, smiling and filled with hope. Team members, Anne-Marie Heino, Greg Howard, Paul and Isabelle Milley, Tara Milley, Nancy Nichols, Martin Parry, Nicole Ray, Lynne Smith, and Bert Voth were also on hand to explain how education, clean water and health care enhance the deep sense of community found in Bufukhula. Proceeds from the ”Hope Abundant” exhibition went directly to Canadian Food for the Hungry once again. These funds go toward the building of a new medical clinic in Bufukhula. Bellevue Gallery would like to thank all those who supported this exhibition through the purchase of art, by donation or in sponsoring a child. Special thanks to Preview Magazine for advertising sponsorship, to Huber Printing for invitation postcards, and to True Colours Graphic Reproduction Ltd. for the preparation of the digitally enhanced images sold in this exhibition. Our heartfelt appreciation and sincere thanks to Global Unity Partnership for the donation of a forty foot container of new medical supplies for the medical clinic in Bufukhula.